Are you a debt counsellor or credit provider? Due to the complexity of the debt counselling process, Debtcounselling.com has partnered with a network of debt counsellors around the country who have been selected based on qualifying criteria ensuring that you are placed in the best hands possible. Fill in the following form and receive a free call back from one of our panel of debt counselling consultants to help you resolve your debt. On-Screen Results. See the solutions you may qualify for. How much are you asked to pay towards these debts each month? How much can you realistically afford each month? We have all heard of instances where unscrupulous debt counsellors have put consumers in a worse off position and charged high fees for doing a sub-standard job. The goal of Debtcounselling.com is to correct this. Debtcounselling.com helps you choose a debt counsellor that knows how to help consumers get out of debt by using the correct systems and processes. We have pre-vetted all of our partners to ensure that the service received is of the highest quality, at the right price. A debt counselling application form is completed and signed, which includes a list of all of your debts, your income, your monthly expenditure and a power of attorney. The power of attorney gives the debt counsellor the right to negotiate with your credit providers on your behalf. Other documents needed are copies of your ID book and payslip. The debt counsellor will then assess whether you are over-indebted. This means that your monthly income cannot cover all of your expenses, including your monthly debt repayments. 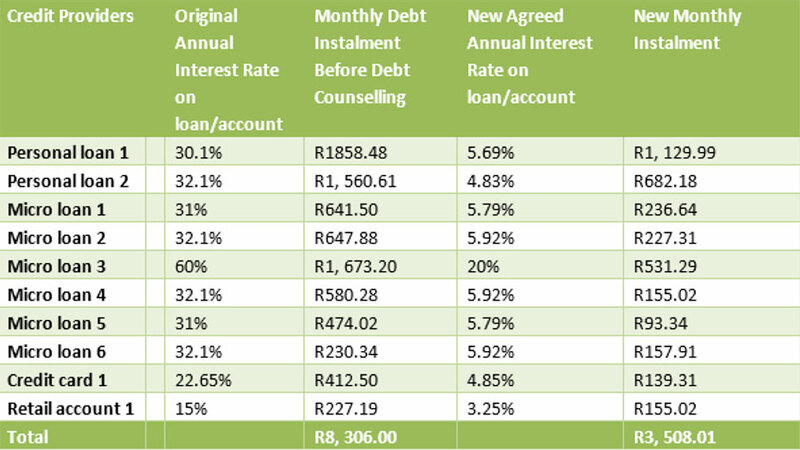 If it is determined that you are over-indebted (monthly expenses, including debt repayments, exceed income), your debt counsellor will notify your credit providers and the credit bureau that you have applied for debt counselling. Your debt counsellor will restructure your payment plan and negotiate with all your credit providers for lower monthly installments, interest rates and fees. You will start paying the reduced, affordable monthly repayment for your debt in the first month. Payments go through a registered Payment Distribution Agency (PDA) to ensure the security of your money and correct distribution. Debt counselling matters are referred to court in order to approve the restructured payment plan and make the new arrangements binding. Your debt counsellor will send a corresponding attorney to the Magistrate’s court to represent your case or may submit your application to the National Consumer Tribunal (NCT). Going forward the most important thing for you to do would be to make your monthly debt counselling repayments on time. Once all of your debts have been repaid you will be issued with a Clearance Certificate stating that you are debt free. The debt counselling flag on your credit report will also be removed. On-Screen Results. Complete the test to see which solutions you may qualify for. 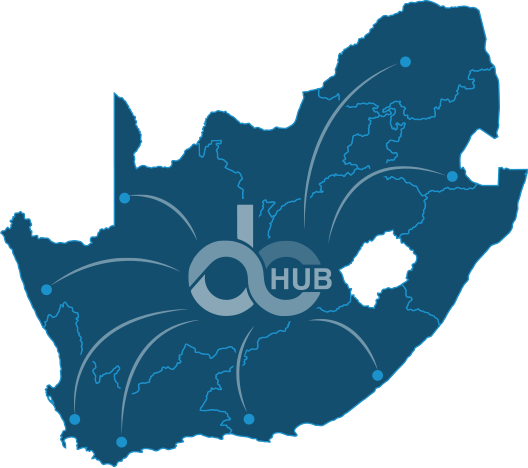 Are there registered DC Hub Debt Counsellors in your area? Click the map pins to find out more. A debt counsellor is an individual who is registered with the NCR (National Credit Regulator) and is fully qualified to provide debt counselling services to individuals. Debt counsellors were formally introduced by the National Credit Act (NCA) to better regulate the process of debt management for consumers. They are able to work independently or within an organisation but must adhere to the correct rules and regulations. All of our debt counselling partners have teams of extremely supportive, qualified and knowledgeable debt counsellors who negotiate with credit providers on the client’s behalf. They assist clients to propose a repayment plan which is affordable and aim to empower and educate them to take better control of their finances along with their future financial decisions. When seeking assistance with your debt, approaching a registered, credible, trustworthy debt counsellor is imperative to avoid your finances landing in the wrong hands. How do I know that a debt counsellor is suitably qualified to assist me? All debt counsellors should be registered with the NCR and must hold a debt counselling certificate displaying the individual’s registration number (e.g. NCRDC3456) which is issued to them upon registration as a debt counsellor. They should also have a proven track record and use the correct systems and processes in order to ensure that your best interests are taken care of. See the “Why use us?” tab in the main menu for more details. 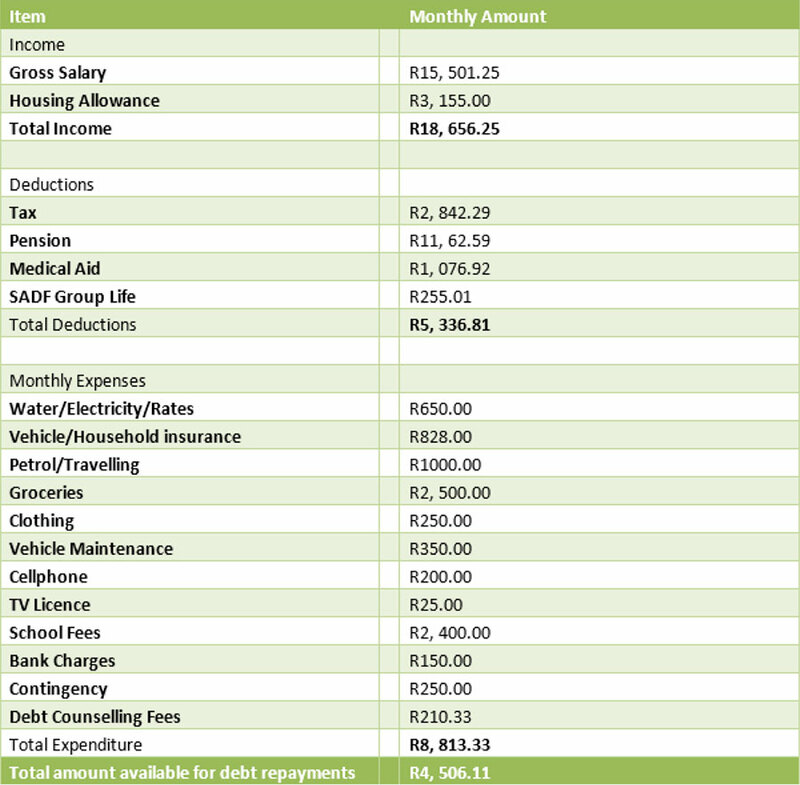 Debt Counsellor’s assess if you are over-indebted by running through your budget. They obtain a credit report from the credit bureau and assess your current financial situation. A debt repayment plan along with a monthly budget is prepared. It is the responsibility of your debt counsellor to send a notification to all your credit providers stating you have applied for debt counselling and subsequently negotiate your new payment plan with them. Debt counselling is a formal debt management solution that was introduced by the National Credit Regulator in 2007. Debt counsellors assist clients with their debt problems through debt counselling which enables them to make affordable monthly debt repayments and regain financial stability. Debt counselling assists clients by reducing monthly debt repayments, and in most instances interest rates as well, therefore putting consumers in a stronger financial position. The debt counselling process assists clients battling to repay their debt obligations. This is done by entering them into a debt repayment plan with their credit providers. It is most suited to consumers who are over-indebted and are struggling to repay their debts and in most instances have missed debt repayments. What are the steps of the debt counselling process? What is the purpose of debt counselling? Debt counselling helps individuals become debt free in an affordable manner. How do you know you need debt counselling? In South Africa, millions of consumers are considered to be over-indebted. Being over-indebted means that you do not earn the required amount of money each month to cover your debt repayments and general living expenses, such as rent, food and petrol. This may have resulted from unforeseen circumstances, over-spending, or expensive situations that are out of your control. How do you know you may be over indebted? What documentation is required for debt counselling? Does my spouse need to apply with me? What is the time frame of the debt counselling process? You should consider debt counselling as a long term solution and not just a quick fix as a lot of commitment is required. The entire process may take as long as five years and is dependent upon your amount of debt, how much you can afford each month and whether or not you have assets. There are many examples of clients being debt free within three years as they have paid additional repayments from bonuses and tax repayments which speeds up the process. Restructure fee – this is usually equal to your monthly debt counselling payment (up to a maximum of R6,840 inclusive of VAT) and is payable in your first month. Rehabilitation payment – this is your monthly repayment. This includes the money distributed to your credit providers, your aftercare and PDA fees. This is an amount determined by your budget. Sundry fee – a once off payment covers the legal application work as well as your court/consent orders. PDA fee – The PDA takes a small fee for their services to ensure accurate and safe distribution of your money to your creditors. Will debt counselling impact employment opportunities? Certain individuals have faced difficulties in the past with regards to employment opportunities whilst being under debt counselling. Many employers did not have the correct understanding of how debt counselling actually worked when it was first introduced. Things have changed and employers are now more aware, so signing up for debt counselling should not have any impact on your current job or on future employment opportunities or prospects. In 2007 Debt counselling was developed in South Africa and introduced as a positive rehabilitation process to assist consumers struggling with debt, and is viewed by most employers in a positive light. Within most occupations, it is important that you are able to show that you can manage your personal finances, especially if your job entails advising others on money management or financial services. Most employers will feel that if you can’t manage your own money properly; you would not be able to give other individuals sound financial advice. Debt counselling is voluntary and therefore by taking your own initiative to sign up for this rehabilitation process, you are taking a responsible step towards repaying your debts therefore showing your employer that you are attempting to take control of your finances instead of neglecting them. Missing your debt repayments will result in defaults and judgments against your name. These will show that you are failing to address your debt problems and are not taking responsibility for your actions which means employers are most likely to view this in a negative light and will be hesitant to hire you. This will be seen in a worse light than making an effort to try resolve your problem. Our debt counselling companies deal with clients from a variety of industries and always ensure confidentiality as employers are not informed about the client’s debt review status. Should a potential employer conduct a credit check and see that you are under debt counselling, it should not have an impact on your chance of success. However, if necessary, our debt counselling companies will provide clients with a letter stating that they are under debt counselling informing the employer about the process. How does debt counselling affect your credit record? Debt counselling does not negatively affect your credit record and actually improves it during the process. Your credit report will indicate that you are under debt counselling, so that you won’t be able to access more debt. All history of debt counselling will be removed after you have been issued your clearance certificate. A Payment Distribution Agency (PDA) is a government regulated agency that is responsible for distributing your monthly debt repayments to you creditors. A PDA will ensure that all of your creditors are paid on time and that your money is safe and secure. It also assists with you making one monthly installment as opposed to yourself or your debt counsellor making payment to 8 or 9 credit providers every month. When all of your debt has been paid off a Clearance certificate is issued to your creditors and the Credit Bureau by your Debt Counsellor to confirm that you have completed the debt counselling process. Your credit report will be updated at the bureaus and the debt counselling flag will be removed from your credit profile. Can you access more credit when under debt counselling? No. You will not have access to your credit cards, retail accounts, overdrafts or any types of new or existing credit while under debt counselling. Debt counselling aims to get you debt free and focuses on the debt you currently have. Now that your monthly debt repayments are more affordable, you will not need to take out any new debt. What happens if you miss your debt counselling payments? Missing payments may result in termination of your debt counselling process by your Credit Providers or Debt Counsellor. This allows creditors to commence legal action against you as you have breached the contract. If you feel you may miss a payment, contact your debt counsellor to see if there is anything they can do to help. Sticking to your new budget will help you make all payments on time. Can you pay more than the amount on your agreed payment plan? Yes. You are encouraged to pay more towards your debt whenever possible. The more you pay, the quicker your debts will be repaid, and the sooner you become debt free. Can you exclude accounts from debt counselling? If any of your accounts have legal action attached they may be excluded from debt counselling by your creditor. You will need to make arrangements with your creditor to pay off the excluded accounts separately. These amounts will be included in your monthly budget. It is always better to have all of your accounts under the process to avoid missed payments. Why should you cancel your debit orders? Your new monthly debt counselling repayment will replace all your prior debt repayments. You stop paying your creditors directly and begin to pay through the Payment Distribution Agency (PDA). The PDA will then distribute the funds to the relevant parties, based on the negotiations that the debt counsellor has completed. If you fail to cancel your old debit orders, they will continue to come off your account in addition to your new Debt Counselling repayment, which you wont be able to afford. Why should your salary be paid into a savings account and not a current account? It is often easier to open a new bank account for your salary to be paid into when you are under debt counselling. This prevents the banks from trying to retrieve your money through money grabs as well as old debit orders running. Your new monthly debt counselling payment will run from this new account. You should move all service agreement (cell phone contract, insurance etc.) debit orders to the new account. Should you continue paying insurance premiums under debt counselling? Vehicles and homes should be insured as a condition of your loan contract. It is important to continue paying all insurance policies while under debt counselling. These premiums, as well as other service agreements, are not included under debt counselling and get included in your monthly budget. What happens when the Court or NCT considers your final proposal? The Court or NCT will consider your application and ensure that all is in order. Once the court order has been granted, your creditors are bound to the new payment plan. Missing payments may result in creditors repossessing your assets and creditors or the debt counsellor cancelling the process, which may result in legal action. What happens once debt counselling has been completed? Can I buy a house, car etc.? When you sign up for debt counselling, the Credit Bureaus and your creditors are notified of your application. The Credit Bureaus will then flag your profile on their system to note that you have applied for debt counselling. This occurs to prevent you from taking out more debt whilst you are under the process. The debt counselling process was designed to rehabilitate you and taking on additional credit would prevent you from gaining financial wellness and becoming debt free. Once you have paid off your debt, your clearance certificate is sent to your Credit Providers, the National Credit Regulator (NCR) and the Credit Bureau. Consequently the Credit Bureaus will remove the debt counselling flag from your profile which would allow you access to credit again. Once you have completed the process, it is important to draw up a new budget and stick to it. You can now focus on saving and investing, due to you not having any more debt to pay, and begin your journey to financial wealth. My current debt counsellor is no longer in industry or I cannot get a hold of them. Can DC Hub assist me with this? The DC Hub registered debt counsellors can assist you by investigating your current debt counselling status. There are many NCR registered debt counsellors, but only a few of them are actively practicing. Our debt counsellors will check to see if your debt counsellor is responsive and if they still exist. If your debt counsellor ceases to exist, one of our registered debt counsellors can assist in restructuring your debt and getting your payment plan back on track.